One of the most choice garden vegetables, asparagus is ridiculously easy to grow. Traditionally it is grown in an asparagus bed of about twenty or more plants spaced about 30 cms apart in three rows about 40cms apart. This spacing gives a greater number of shoots of smaller dimension than the normally wider commercial spacing. It would also be possible to grow a small patch of five or six plants grouped together in a sunny part of a mixed border, where the ferny leaves would be most attractive in summer. Asparagus is a perennial vegetable, a member of the lily family, interestingly. The plants will last for decades, if kept free of weeds and fed a rich diet of well-rotted garden compost. Raise plants from seeds sown in spring or early summer and transplanted to their permanent positions two years later, or speed up the process by buying plants. 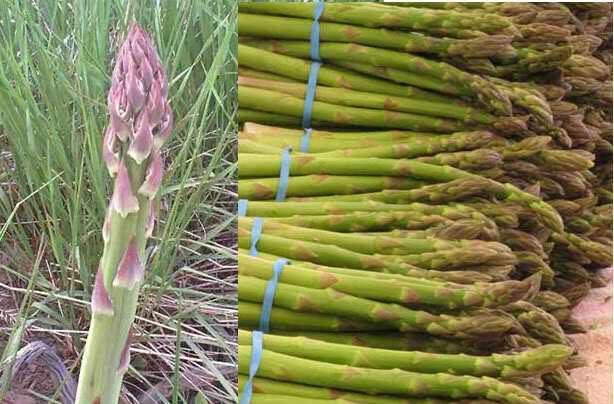 Unusually for a vegetable, asparagus has male and female plants, one carrying pollen, the other the berry-like seeds. Male plants are best because they do not waste energy on making seeds, saving all their growth for producing succulent shoots. Most modern varieties are bred to have more males. Fresh asparagus from the garden is unsurpassed for flavour. When buying asparagus, choose firm, bright green or ivory stalks with tight tips. It is best cooked the same day that it is purchased but will keep tightly wrapped in a plastic bag 3 to 4 days in the refrigerator. Asparagus is grown in sandy soil so thorough washing is necessary to ensure the tips are not gritty. If asparagus stems are tough remove the outer layer with a vegetable peeler. Asparagus contains a quantity of vitamin A and is a rich source of iron, vitamin B and C.
‘Connover's Colossal' and ‘Martha Washington' are tried and trusted varieties with large spears. ‘Lucullus' is an all-male variety, and newer all-male varieties such as ‘Andreas' and ‘Geynlim' are becoming available. Sow the seeds about 5cm apart in April or May in good soil in full sunshine. Choose a sunny, open but not overly windy spot, ideally on sandy soil. Dig in plenty of well-rotted organic material. Plant in spring. Start with ground free of weeds, especially perennial weeds. Control weeds, especially before the ‘fern' develops in summer. Watering is not a priority but one or two heavy soakings are beneficial in a prolonged dry spell. Usually the first spears can be cut in late April or May the year after planting. Do not take too much to start with as it weakens the plants. Largely trouble-free, watch for greenflies that occasionally land on the spears. Simply wash these off; it is too close to harvest for anything else.